A diver from Stantec, an engineering services company, descends into the Scioto River to inspect Fishinger bridge. It’s not typical to spot a diver, in flippers and full helmet, plunging into the Scioto River. But on Thursday, some amused kayakers and joggers on a nearby bike trail caught sight of a commercially licensed diver swimming below the surface to inspect the Fishinger Road bridge on the Northwest Side. Federal law requires bridges to be inspected every two years, but Ohio requires inspections annually. Underwater inspection is required every five years. Franklin County paid $21,000 to Stantec, an engineering company based in Lexington, Kentucky, to bring in a diving crew. Of the 357 bridges the county owns, only three require a diver for underwater inspection, said Ed Herrick, the county’s bridge design engineer. Most others can be done by wading into shallow water. 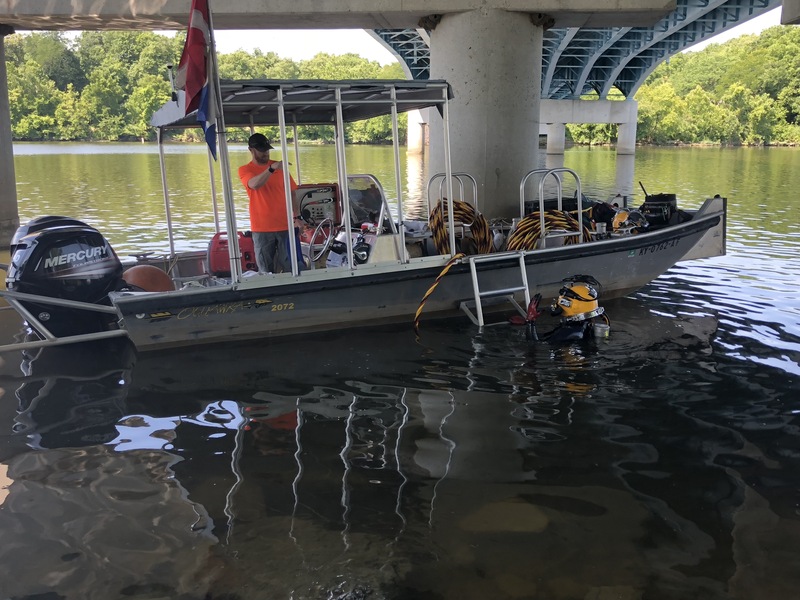 Steve Reuschle, a Stantec diving service manager and engineer, and his team was searching for any cause for alarm: a crack, logjams and general soundness of the concrete pillars supporting bridges on Hayden Run, Fishinger and Smothers roads. Although the diver is not an engineer, he has a camera attached to his helmet, providing Reuschle with real-time communication and a video feed from the boat. Generally, Reuschle said, routine inspections do not find a lot of problems in areas such as Columbus where the water current isn’t strong. Because the team is inspecting only the three bridges, it plans to finish Friday after two days, spending one to four hours at each bridge. Bridges are rated on a scale of zero to nine, Herrick said: Nine is pristine condition and built within a year, and zero meaning failed condition. Franklin County bridges average a seven. The lowest bridge rating in the county is a four, with upgrades planned in the next year. Franklin County has 10 major bridge-repair projects — which will include replacement or rehabilitation — planned for 2018-2019. Originally published by The Columbus Dispatch on July 12, 2018.